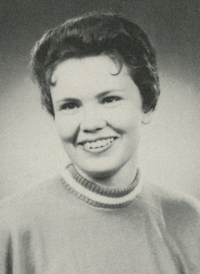 Obituary – Qualls, Elmira Ann (Phelps) « Perry High School Alumni Association, Inc.
﻿Class Assembly 54-55, Red Hots 54-57, Red Hot Vice-President 55-56, Red Hot Secretary 56-57, All School Revue 55-56, Office Staff 54-57, Senior Class Secretary 56-57. Elmira Ann Qualls, 66, Stillwater, died Saturday, Feb. 25, 2006, in Oklahoma City. Services, under the direction of Strode Funeral Home, will be at 10:30 a.m. Wednesday in Strode Funeral Home Chapel in Stillwater. Interment will be in Grace Hill Cemetery in Perry. Family will greet friends at Strode Funeral Home from 6:30 p.m. to 5 p.m. Tuesday. Qualls was born April 13, 1939, in Orlando to Fred and Martha (Baumgartner) Phelps. She attended school in Perry, graduating from Perry High School in 1957, and she remained a devoted Perry Maroon. After high school, she attended Draughn’s School of Business in Oklahoma City, receiving her diploma in 1959. She then worked for American First Title and Trust and Southwest Canvas in Oklahoma City. After that, she worked for OSU for 16 years as senior secretary in the biochemistry department. She loved her co-workers and her interaction with the many students she met and assisted throughout her years at OSU. In 1996, she received the Distinguished Service Award from OSU. Her greatest joy was spending time with her grandchildren and watching her beloved OSU cowboys play ball. She will he missed by all those who knew her and loved her. She was a member of Highland Park Freewill Baptist Church. Survivors include one son, Zane Qualls and his wife Linda; three daughters, Robin Stigall, Shari Crawford and Jennifer Harrison and her husband Toby; nine grandchildren, Brandi Lynn Stigall, April Renee Stigall, Douglas Albert Crawford, Derek Zane Crawford, Kara Michelle Qualls, Cole Davis Harrison, Dane Todd Harrison, Lucas Samuel Qualls, and Zachary Taylor Qualls; and one sister, LaNelma Johnson and her husband Ray.